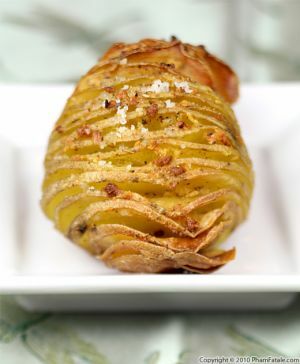 The preparation of this visually striking potato dish is fairly easy if you own a mandoline. Very-thinly-sliced potatoes are parboiled, then brushed with a butter and oil mixture. 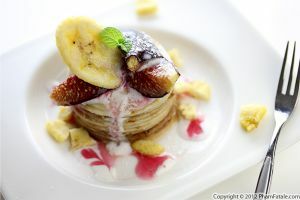 The slices are then stacked in individual ramekins to mimic flower petals. It’s an elegant and innovative way to have potatoes as a part of your Thanksgiving table. With my first cookbook on shelves very soon (it's due out on December 18th), I'm going to be posting a lot of potato dishes that didn't make into to the book. If you’re interested, you can pre-order it on Amazon or Barnes and Noble! Brush 8 ramekins with olive oil and line the bottom with a round of parchment paper. Set aside. Prepping the potatoes: Peel the potatoes. 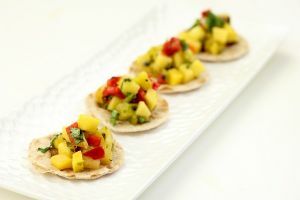 Shave them lengthwise using a mandoline slicer on the thinnest setting. Par-boiling the potatoes (see tips): Immediately place the thin potato slices in a large pot. Rinse the potatoes and then add cold water until the potatoes are covered. It's important to start with cold water so the potatoes cook evenly. Bring to a boil, add 1 teaspoon of salt and reduce the heat to medium-high (if you cook the potatoes at a roaring boil, they might fall apart). Cook for about 4-5 minutes. The potatoes should still be firm. Drain the potatoes thoroughly and let them cool a little on a baking pan. Once the potatoes are cool enough to handle, pat them dry. Roasting the potatoes: In a small bowl, combine the butter and oil. Stir well. Brush the potatoes with the mixture on both sides. Season with salt and pepper. 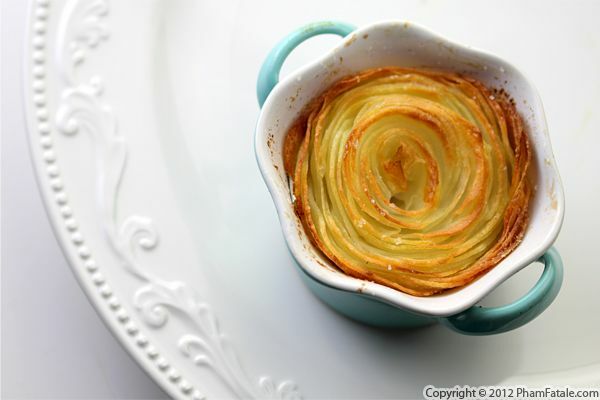 Stack the potato slices against the wall of the ramekins, forming rose petals, until you reach the center of the ramekin. Sprinkle the top with salt. Transfer the ramekins to a baking sheet and roast for 30 minutes at 400°F, then increase the temperature to 425°F and bake for about 10-15 more minutes. Watch the top carefully; when there's a nice crisp crust, your potatoes are ready! Parboiling means briefly boiling the potatoes. Think "par-tial" boiling = parboiling. 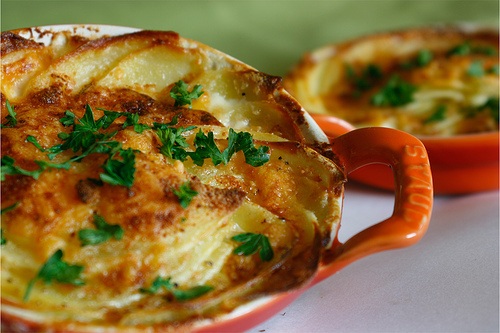 You could skip this step but you'll have to bake the potatoes in the oven for a longer time. Once the potatoes are sliced, place them immediately in water or they'll darken. If you don't plan to parboil the potatoes right away, simply cover them with water and a drizzle of freshly squeezed lemon juice to prevent oxidation. 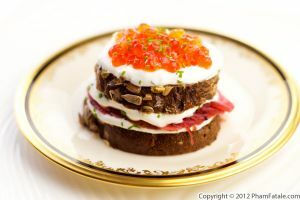 The top of the dish should be crispy golden and the inside completely soft and tender. 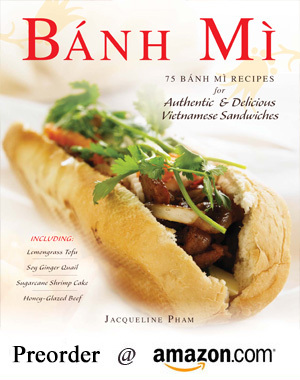 Published By: Jacqueline Pham on November 8, 2012.